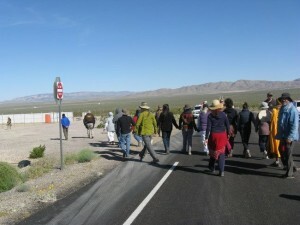 On March 26, I was in Nevada in my role as event coordinator for Nevada Desert Experience, preparing for the annual Sacred Peace Walk, a 65-mile trek through the desert from Las Vegas to the nuclear Test Site at Mercury, Nevada, an event that NDE has sponsored each spring for about 30 years. Two days before the walk was to begin, a car load of us organizers traced the route. The last stop but one on the traditional itinerary is the “Peace Camp,” a place in the desert where we usually stay the last night before crossing Highway 95 into what is now known as the Nevada National Security Site. When we got there we were surprised to find the entire camp and the way leading from it to the Test Site surrounded by bright orange plastic snow fencing. There was no apparent reason for the fence and no apparent access into the camp, which had been a staging area for anti-nuclear testing protests for many years. Not only were we blocked from our traditional camp site, there was no safe, legal or convenient place to park vehicles for about a mile around, nowhere that we could even drop off equipment or allow for dropping off those participants in our protest who could not make the long walk over rough terrain. We were only beginning to assess the logistic difficulties this new situation presented when a Nye County Sheriff’s deputy drove by. After warning us that it was illegal to be stopped on the road as we were, the deputy allowed us to tarry while he explained the situation as he saw it. Some big shots at the university, he said, had convinced the Nevada Department of Transportation that the Peace Camp is a site of historical significance and so could not be messed with. The fences went up just a week or so earlier, he said, in anticipation of the Sacred Peace Walk. The artifacts of past protests would not be allowed to be disturbed by the presence of contemporary protestors. No one but archeologists, the deputy told us, would ever be allowed in the camp again. The irony of this picture was not lost on us. Returning to Las Vegas, I immediately started calling various offices of the Department of Transportation, especially the numbers I found (to some surprise) for the DOT’s office of archeology. I also did a web search of issues around Peace Camp and its history and found that in 2007, the U.S. Bureau of Land Management (the BLM claims ownership of the site) and the Nevada State Historic Preservation Office had determined that Peace Camp is eligible for listing on the National Register of Historic Places. While the implications of this designation for us were still unclear, it was gratifying to know that at least a couple of agencies in the federal and state bureaucracies recognize, along with some of the academic anthropological community, the fact that a couple of generations of antinuclear activists had “made a significant contribution to the broad patterns of our history.” Designs, symbols and messages effected by arrangements of rock of different colors and sizes (“geoglyphs,” in archeology talk) and the graffiti scrawled on tunnels under the highway have official recognition that they “possess high artistic values” deserving to be protected by law! We had already left Las Vegas on our five day trek to the Test Site before return calls from the various agencies confirmed that the deputy had misunderstood the state of affairs. The fences were not put up to protect the Peace Camp from peacemakers, but as a temporary measure to prevent some contractors who were about to begin road repairs from running through it with their heavy equipment. A gate in the fence would be opened to let us in. Parking, camping, setting up a field kitchen, all would be allowed as in the past. This news was a relief. We had expected and even planned for confronting the National Nuclear Security Administration when we arrived at Mercury and the Test Site and furthermore, expected that many of us would be arrested for trespassing there, despite the permission grated to us by the Western Shoshone National Council, legal owners of the land. We did not wish, however, to contend with the Nevada State Historic Preservation Office, and getting arrested for disturbing an archeological site does not carry with it the same moral cachet as the struggle against potential nuclear annihilation. The chief archeologist for the Department of Transportation was particularly effusive in his high estimation of the significance of Peace Camp. Peace Camp is the only designated historic site in Nevada, he boasted, that is less than 50 years old. My own experience with Peace Camp and the Test Site, is perhaps less than historic. I was there once at the height of protests there in 1987, again sometime in the 1990s, and then with increasing frequency after the protests against drones operated out of nearby Creech Air Force Base began in 2009. Until this encounter, I confess that I thought of Peace Camp as little more than a convenient place from which to stage protests against nuclear bomb tests conducted on the other side of Highway 95. The mushroom clouds of the first tests conducted at the Nevada Test Site could be seen from far off Las Vegas. The Limited Test Ban Treaty in 1963 moved the tests underground. Although the United States did not ratify the Comprehensive Test Ban Treaty, it stopped full scale testing in 1992, though “subcritical” testing of weapons, tests that stop short of critical mass, are still conducted at the site. From 1986 through 1994, 536 demonstrations were held at the Nevada Test Site involving 37,488 participants, with some 15,740 activists arrested. Many of the demonstrations in those years attracted thousands at a time. This year’s Sacred Peace Walk and our April 3 Good Friday protest at the Test Site was modest in comparison, with about 50 participants, and we were happy that 22 of these were arrested after crossing into the site. The numbers coming to protest testing in Nevada decreased sharply with the end of full scale testing there, and it is not surprising that nuclear testing is not the burning cause of the times. Protests at sites more directly involved with nuclear weapons development still gather respectable numbers. Just three weeks before our most recent protest, about 200 protestors camped outside the gates of Creech Air Force Base, the hub of drone murders just down the highway from the Test Site. It is crucial, though, that some of us keep showing up at the Test Site and using our bodies to add to the slowly growing tally of those who risk arrest there to say no to the unspeakable horror of nuclear war. Thousands of workers still drive each morning from Las Vegas to report for work at the Nevada National Security Site. We do not know all the hellish works that are planned and carried out beyond the cattle guard. Some are conducting subcritical tests, others no doubt are simply keeping in practice, training new workers and maintaining the equipment and infrastructure for the possible resumption of full scale tests. The day a rogue president gives the order, the Nevada National Security Site will be ready to detonate nuclear explosions under the desert sands. Against the likelihood of that terrible day, we must keep in practice, too. We must maintain our mailing lists and data bases, send messages of encouragement and information in newsletters and email blasts, keep all channels of communication open. We must nurture our friendships and love for one another. Perhaps our peace walk and act of civil resistance at the test site, tiny in comparison to the big protests of the 1980s, could be considered a “subcritical demonstration,” a test by which we can measure our potential to mobilize in resistance to full scale nuclear bomb testing if we need to. The protests at the Nevada Test Site have appropriately been recognized for their historical significance. Perhaps one day tourists to Nevada will leave the casinos for a time to visit Peace Camp as a place of celebration and hope, where humanity turned from its path of destruction. On that day, the Nevada National Security Site, restored and returned to the sovereignty of the Western Shoshone Nation, will be a monument of regret for crimes perpetrated there against the earth and its creatures. This time has not yet come. What will be regarded as the history of the Peace Camp and Test Site, not to mention the history of this planet, is still being written as we walk and as we act. Brian Terrell is a co-coordinator of Voices for Creative Nonviolence and a member of the governing council of the Nevada Desert Experience. Brian can be reached at brian@vcnv.org. Read other articles by Brian. This article was posted on Wednesday, April 22nd, 2015 at 2:52pm and is filed under Activism, Nukes, Resistance, Weaponry.